Stacey Nuveman, easily the top softball hitter I’ve ever seen and arguably the top power hitter in the sport’s history, received some very good news last week. The former St. Lucy’s Priory and UCLA star survived the final cut list for the 2008 U.S. national team that will compete at the Beijing Olympics this summer. She makes possibly the United States’ final softball roster after giving birth to her son, Chase, in June. 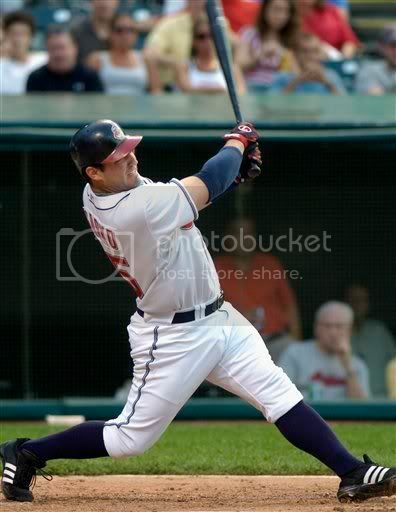 Nuveman was a key part of the U.S. team’s Gold-medal victories in 2000 and 2004, getting the only hit in the 2000 Gold-Medal game and hitting a home run in the 2004 Gold-Medal game. She is also the most prolific power hitter in the sport, ending her collegiate career at UCLA as the the NCAA record holder in career home runs with 91. She was a four-time All-American for the Bruins, finishing her collegiate career with a .466 batting average and 1.016 slugging percentage. The former Stanford University baseball star, who is now with the Cleveland Indians, did not prep at a local high school, but he did grow up in Walnut and still calls the (909) city home. Many are expecting this to be a break-out year for the Walnutite. Garko, who played high school baseball for Servite, hit .292 with seven home runs in just 185 bats in his rookie season two years ago, then followed it up by hitting .289 with 21 homers last season. Is .300 and 30 knocks around the corner this season? Many are expecting those type of numbers, so he could be a steal in your fantasy baseball league drafts. Kevin Hansen was one of the top baseball players in Southern California when he was at Glendora High School earlier this decade, and he continues to tear it up on the ball field in college. Hanson is a key member of the University of San Diego baseball team, which has been one of the top teams in the country the past two years. Hanson, the team’s starting third baseball, is off to another solid start, hitting .310 with 10 RBIs for the Torreos, who are ranked No. 14 by Baseball America. Hansen earned All-West Coast Conference honors last season after hitting .316 with 34 RBIs. Former St. Francis High School shortstop Joe De Pinto is making the adjustment to collegiate pitching at USC. He has appeared In 16 of the Trojans’ first 20 games and it batting .146 with four runs batted in. Three of his six hits have been doubles. De Pinto has a .911 fielding percentage with 24 putouts, and has been part of six double plays. Above: St. Francis graduate Joe De Pinto. Former Pasadena Poly standout Rob Rasmussen has appeared in just one of UCLA’s first 18 games. The hard-throwing left-hander worked 2 2/3 innings in his lone start, allowing three hits, two runs and one walk, while striking out three. Above: Former Pasadena Poly pitcher Rob Rasmussen. Remember April Valdez, the former All-Valley softball star, who along with Jamee Juarez, led Wilson to a CIF-Southern Section title in 2000? She’s back, working as an assistant for two-time CCCAA state champion Mt. San Antonio College. Valdez has accomplished a lot since leaving the friendly confines of Hacienda Heights. She signed with DePaul out of high school and played played one season with the Blue Demons, hitting .415 and earned first team All-Conference USA honors. She then transferred to the University of Oklahoma. She played in 87 games in two years withe Sooners, stealing 16 bases and going 2-1 in the circle with a 2.27 ERA. Oklahoma advanced to the Women’s College World Series her senior year. She also played for the Arizona Heat of the now defunct Pro Fastpitch league. That’s Jill Matyuch, the former Charter Oak High School softball coach who who guided the Chargers to their last CIF-Southern Section title in 1993. She is now the head softball coach at Ohio University. Matyuch is in her third year as the chief Bobcat. Ohio has averaged 27 wins her first two years and is 6-7 this season. Since leaving Charter Oak, Matyuch was also an assistant coach at Texas, helping the Longhorns advance to the NCAA Tournament three times and to the Women’s College World Series twice. She recruited several Southern Californians to the Lone Star state, including South Hills’ Alexis Garcia. Matyuch was not a prep star from the area, having prepped at El Dorado High in Placentia, but her ties to the Valley were established when she took over the Charter Oak softball program in 1993 and guided the Chargers to an undefeated season and a CIF-SS title in her first year. Matyuch, Student Sports Magazine’s State Coach of the Year in 1993, coached at Charter Oak until 1997. But unknown to many Hall of Fame quarterback Troy Aikman, who played at UCLA and for the Dallas Cowboys in the NFL, is a Valley native. Aikman was born in West Covina and was raised in Cerritos until his family moved back to their roots of Oklahoma when he was 12. Most know the story from there. Aikman was an Oklahoma prep star, enrolled at Barry Switzer U, err, the University of Oklahoma, broke his leg his freshman season and transferred to UCLA. He was then the No. 1 overall pick in the 1989 NFL draft by the Dallas Cowboys, who he led back to greatness. The West Covinaite is one of only four quarterbacks to win at least three Super Bowls and the first to win three in a four-year period. Do you know who the others are to win at least three? And who else won three in four years? How ’bout that Wes Roemer? State Fullerton, appears to be on the fast track to the Majors. ERA and striking out 18 in 12 innings. Dreshawn Vance, a former All-Valley boys basketball player from Walnut High School, is filling the nets at Cal Poly-San Luis Obispo. Vance, who transferred to Cal Poly from the University of Portland, is averaging eight points per game and nearly five rebounds per contest for the Mustangs, who are 11-16 overall and in sixth place in the Big West with a 6-8 record.